An Old Warrior’s Meditations on the Art of Killing in the Iron Empires, Addressed to My Most Warlike Prince. 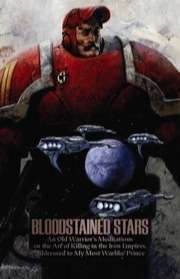 Bloodstained Stars contains expanded source material for waging war and combatting the Vaylen threat in Christopher Moeller’s Iron Empires universe. It is also a setting book for the Burning Empires roleplaying game (but contains no mechanics).